Artyfarty Gallery opened the doors to their latest show called ‘The Road Less Traveled’ by San Francisco’s own street artist Jeremy Fish last Saturday. 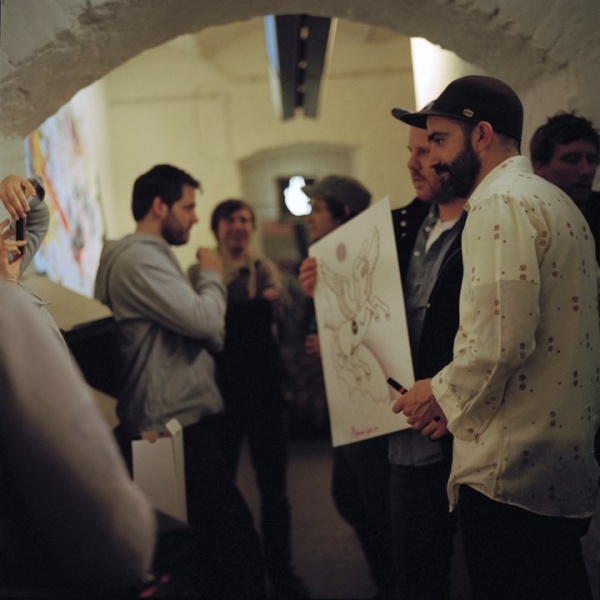 It was a night with cool people, who had the rare chance to buy very limited art pieces by Jeremy Fish. The artworks are mainly about storytelling and communication, told through a library of characters and symbols. If you are in the area around Cologne, Germany, make sure to stop by to get a closer look at the illustrations and wooden art pieces. You might not see this stuff very often. It was really a nice evening! Nice people to chat with and awesome art, both on walls and on shirts!